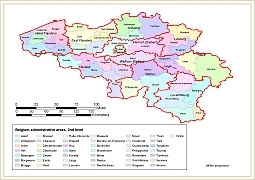 Editable royalty-free map of Belgium in vector-graphic online store. Area: 11,780 sq mi (30,510 sq km) / World Rank: 139 Location: Northern and Eastern Hemispheres; Western Europe bordering the North Sea between France and the Netherlands Coordinates: 50°50′N, 4°00′E Borders: 859 mi (1,385 km) total boundary length France, 385 mi (620 km), Germany, 104 mi (167 km) Luxembourg, 92 mi (148 km), Netherlands, 280 m (450 km) Coastline: 41 mi (66 km) Territorial Seas: 12 NM (22 km) Highest Point: Mt. Botrange, 2,277 ft (694 m) Lowest Point: Sea level Longest Distances: 174 mi (280 km) SE-NW/ 137 m (222 km) NE-SW Longest River: Meuse, 580 mi (933 km) Natural Hazards: Flooding threatens reclaimed coasta areas that are protected by dikes. Population: 10,258,762 (July 2001 est.) / World Rank: 77 Capital City: Brussels, located in the center of the country Largest City: Brussels, 1,122,000 (2000 est.) 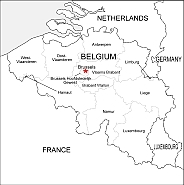 OVERVIEW BELGIUM IS A FAIRLY NEW country that became independent from its Dutch only settled in 1919. The country is split in two by the valley of the Meuse River.To the north lie flat, fertile plains stretching to the coast. A thriving textile industry grew up here in the 16th century around cities such as Bruges, which is still known for its lacemaking. To the south lie the Ardennes Mountains, a region of poor soil and scattered farms. 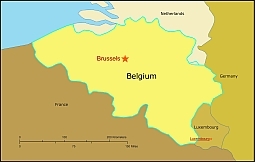 A small but densely populated country, Belgium is located in a part of northwestern Europe once called the Low Countries and today known as the Benelux region (primarily due to Belgium’s economic partnership with its neighbors Luxembourg and the Netherlands). Situated at the southern tip of the North Sea, it is bordered by the Netherlands to the northeast, Germany to the east, Luxembourg to the southeast, and France to the west and southwest. With its central location and with few natural fron- tiers, Belgium has been called the crossroads of Europe. For much of its history it was a battleground for the major European powers of France, Britain, and Germany. Its capital, Brussels, is the seat of both the North Atlantic Treaty Organization (NATO) and the European Union (EU), and is within 621 mi (1,000 km) of most other West European capitals. Belgium’s central location has also made it an important Western European financial and commercial center. Belgium lies on the Eurasian Tectonic Plate. It can be divided into three major geographic regions: coastal plains to the northwest, a low central plateau region, and the Ardennes highlands to the southeast. An extensive system of dikes has allowed to Belgians to reclaim substantial amounts of land from the sea. Rivers flow throughout the country, and there are many canals in the plains and central plateau. THE COAST, ISLANDS, AND THE OCEAN Belgium is situated at the southern tip of the North Sea. The coastline is nearly straight, and the beach is white. It is practically free of pebbles and stabilized by fences called groins, which reach from the higher beach into the water. Behind the beach lie dunes and behind them the polders (wetlands reclaimed for agricultural use in the Middle Ages). CLIMATE AND VEGETATION Temperature Belgium has a temperate maritime climate with moderate temperatures in both summer and winter, with wet westerly and southwesterly winds. Except for the mountainous Ardennes region, its climate resembles those of northern France, the Netherlands, northwestern Germany, and the British Isles. The mean temperature in Brussels ranges from 37°F (3°C) in January to 64°F (18°C) in July. The higher Ardennes and Campine regions have more of a continental climate, with winter temperatures below 32°F (0°C). NATURAL RESOURCES Although once a significant coal producer, Belgium now has to import most of its basic raw materials and is heavily dependent on crude-oil imports. There are still some coal deposits in the Sambre-Meuse Valley and in the Campine region. Belgium has a thriving diamond cutting industry and is known as the diamond capital of the world. There are small deposits of lead, copper, zinc, and iron ore in the Ardennes, but Belgium has no metal ore deposits that are commercially exploitable. Chalk, limestone, and stones used in construction, such as granite, are plentiful.